It's a Halloween miracle, everyone. A kitten who sustained severe burns when he got trapped in the engine of a car is being nursed back to health. Once inside, he got stuck. 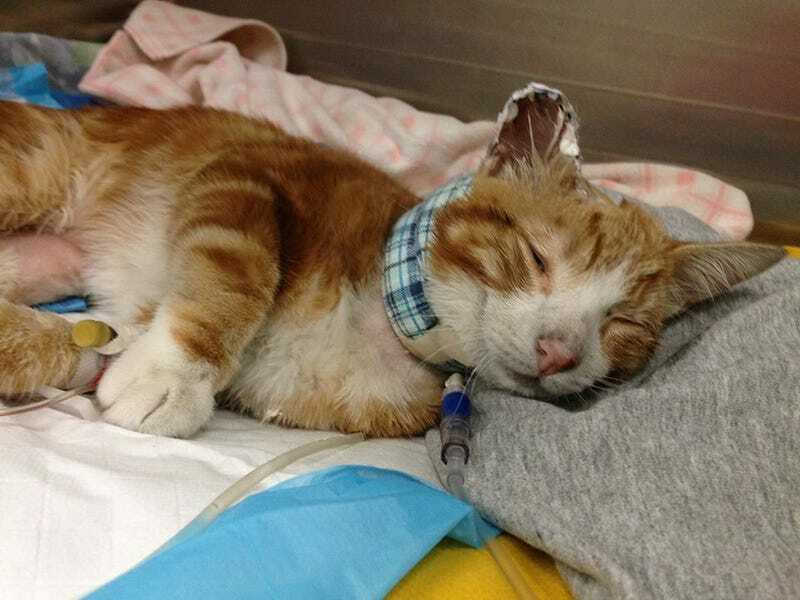 The owner of the car drove to work the next morning, and as the engine heated up, the cat sustained severe burns and, the veterinarians who would later care for him said, at one point may have even caught on fire, according to his fundraising page. Fortunately the driver noticed something off about his steering wheel. When he arrived at work, he popped the hood and found the little cat staring at him. He was originally dubbed "Engy" by rescue workers who came to help him. Mr. Biscuits was treated by local emergency animal clinic and then taken to the Metropolitan Veterinary Associates and Emergency Services, where they renamed Mr. Biscuits because he was kneading on his blanket like dough. Mr. Biscuits was later taken in by a rescue organization called The Grannie Project, where he continues to recuperate from his injuries. The Grannie Project usually only takes in older cats but of course they made an exception this time for Mr. Biscuits (THAT FACE). The Grannie Project is slowly nursing Mr. Biscuits back to health. He has a long road ahead of him before he is good as new, though Cox has high hopes. "He is hanging in there," she said. "His spirits are high and he is winning the hearts of the nurses and doctors who are caring for him around the clock." The fundraising page set up by The Grannie Project to help pay for his care has already surpassed their original $14,000 goal. (This is so much better than giving money to egg salad, you guys). "Every dime goes directly to paying the vet bill for Mr. Biscuits care," Cox told NBC Philadelphia. "His initial assessment and stabilization was over $1,500 and his costs right now are running about $750/day." I'm just happy to be here, getting some quality lovins, and helping educate people about cats like me who seek out warmth on car engines. All it takes is a simple tap on the hood or beep of your horn before you start your car in the cold. You could save a life! Images via Mr. Biscuits Facebook.